The Verein Deutsch Drahthaar was created in Germany in the late 19th century by a group of dedicated breeders who set out to develop a versatile hunting dog that would hunt in the field, forest, and water. 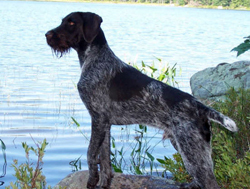 They took the best dogs of the coarse hair breeds, and cross-bred them with shorthaired breeds of the Stichelhaar, Pudelpointer, Griffon, and the Deutsch-Kurzhaar. The Deutsch-Drahthaar is a mid-sized dog. The height at shoulder varies from around 61 to 68 cm for males, and 57 to 64 cm for females. The coat is generally wiry, and tightly fit with a thick under wool. This coat was developed to provide optimal protection from external influences such as moisture, cold and heat, as well as thorns, brush and insects. 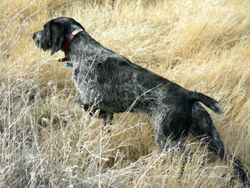 Many breeders of the German Wirehaired Pointer refer to their breed as Drahthaar, which is incorrect. In addition to significant differences in breed standard, the Wirehair has been bred without regulation or restriction since the late 50's. Performance testing proves the ability of the Verein Deutsch Drahthaar. 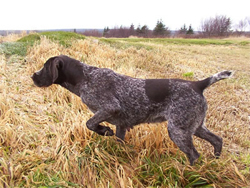 They have a sensitive nose with strong pointing, tracking and retrieve skills. Today's Verein Deutsch Drahthaar is a hard working versatile gundog with endurance, willingness to obey, and to concentrate on the task at hand. The Verein Deutsch Drahthaar can handle any adverse waterfowl hunting conditions. Along with this they blend well in the family environment. Additional breed information for the Verein Deutsch Drahthaar can be found at the Verein Deutsch Drahthaar Group North America Website.